Just an idea for a block. The low friction tube could fit for example a boulder or the flaming ball thingy. Dont think i need to explain more about what a tube is... its a tube! This is of course not a priority, but it would be nice to see it being implemented in a future patch. The half-pipe already does this, no? 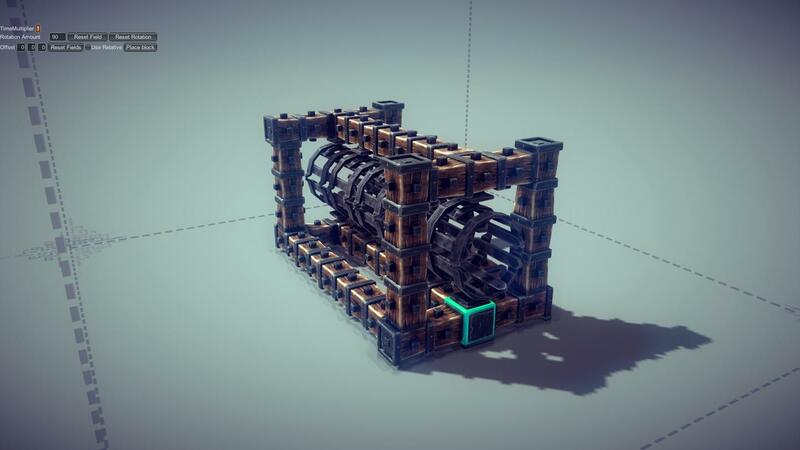 Basically a Giant cannon that you can put things in? you can have it 2 blocks long or something so that you can adjust the length. Its probably alot to ask for, but it would be awesome. it also fits the theme of the game i would say using cannons on peasants was a pretty common thing i would say in medieval ages. Well if they introduce liquids like hot oil and stuff then they could just add a pipe. That pipe could also be used as part of a cannon if they allow it to be used like that. Can't you put two halfpipes together to seal them? Are you sure halfpipes don't do what you want? Oh yeah that does look pretty sealed... Not sure what MichaelRotmo wanted then?? That's what I use for cannon designs. Slap a reloading mechanism on it (gravity fed, grabber fed, whatever) and fire it with a ballast block on springs. There's an example of the design on the chaos tank video in my sig. You could propel a projectile forward through this barrel with the force of an explosion, provided we had explosives small enough to not destroy the machine in doing so. There's no "air" as such in the Unity engine, it's all abstracted Newtonian physics. maybe ill have to check that. If you are correct, then a primary charge block would be a good addition to the game. Now this, this I can get behind. What about a 1x1 directed explosive block? Would be a good addition. I have been tinkering around with the bomb, and ive managed to not completely ruin my machine when it goes off, but sadly there is not enough force to propel the boulder forward. A directional explosive block would be a welcomed sight!